I spent a couple of hours today getting ready for HIMSS. Priority one was outlining my agenda for continuing medical education sessions, which was tricky since it always turns out that there are multiple sessions I want to attend at the same time. The conference offers 22 hours of the specialized credit that informaticists certified by the American Board of Preventive Medicine need. HIMSS delivers the sessions on demand as part of your HIMSS registration, but my experience last year was that some of the audio recordings were poor quality. There is also no substitute for attending a session in person and being able to participate in the discussion or connect with colleagues. I chose a primary and alternate session for each available time slot, but we’ll see what happens when I get to Orlando and the exhibit hall is beckoning. I also worked on planning my social schedule, which also had too many overlapping offerings. I’ll be doing the exhibit hall booth crawl with at least four good friends. It’s always enjoyable to get other people’s opinions on new technologies and solutions. Of course it’s always a bonus to have someone help you scout out interesting shoes or create a diversion so you can photograph footwear or badly-behaved booth personnel without being too obvious. Speaking of shoes, I spent some time looking for the perfect solution to get me through five days of nonstop walking. Last year I had some awesome pink running shoes from Edifecs as part of their #WhatIRun campaign. I’ve pretty much run those into the ground since then, but enjoyed being part of their campaign. I didn’t have much luck shopping, so I might have to pull out some sparkly running shoes to get through the week after all. HIMSS is the virtual Super Bowl of conferences, so making sure I have a solid packing list was also part of today’s prep. I have a growing number of devices and various pieces of wearable tech that unfortunately involves a growing number of chargers. I have a universal adapter that takes care of the Android vs. iPad problem, but my Garmin watch has its own charger, as does my new favorite piece of wearable tech, my Ringly bracelet. I had heard about Ringly more than a year ago, but am not big on wearing rings and was worried about the size of the stone being too much for me. I joked that if they ever came out with a silver bracelet, I’d be the first to order. Shortly after that, they came out with a stainless steel version, so I went on the waiting list last spring. I had to wait until the fall for it to arrive and have been putting it through its paces over the last several months. I’m pleased to say it’s HIMSS-worthy. I’ve never ordered a piece of jewelry sight unseen, so I was a little nervous about it. It arrived in a big chunky cube of a box with the bracelet front and center. Sliding off the outer sleeve revealed the charging box nested underneath. The charger connects via USB to your laptop or USB transformer of choice. Not a problem for me since I usually end up charging things off my docking station anyway. Advertising on the website at the time I ordered it said that the charging box had its own battery and would hold an 8-10 day charge depending on use. I was disappointed to learn that only applies to the ring version. For the bracelet, I’ll have to tote the charging box when I travel more than 2-3 days, which is what seems to be its maximum lifespan. I can forgive the lack of clarity on the website since they’re a startup and when I ordered they weren’t even shipping product yet. Still, having a battery in the box would be an improvement for those of us who travel. Having to pack the charger, however, is a small price to pay for what the Ringly does. I don’t like carrying my phone in a pocket. It’s way too bulky even if I take it out of its protective case. If I put it in a purse, I have to turn the ringer on, which isn’t a great idea most of the time. I don’t like to carry my phone in my hands or leave it on the table when I’m out, which a lot of people do, but just isn’t my thing. 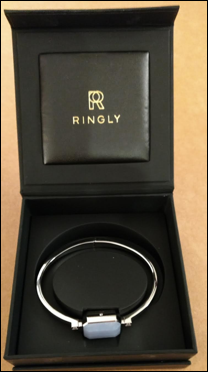 The Ringly solves that problem – not only by providing discreet vibratory notifications, but best of all, it allows me to screen my calls and texts by configuring contacts in the Ringly app. 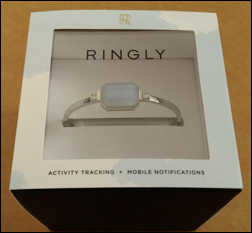 The Ringly app connects with dozens of other apps to provide notifications through a combination of vibrations and LED flashes. You can set it up dozens of ways, depending on how many buzzes and what color blink you associate with each app. 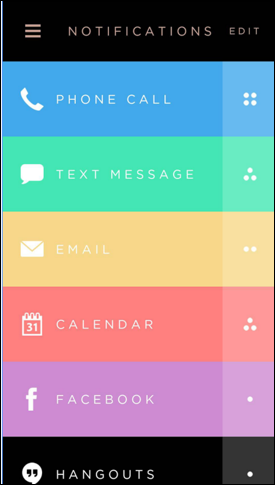 For phone calls and texting, it links to your contacts and you can set it to either flash an additional color for certain people, or you can set it to only receive calls and texts from certain contacts. The LED is pretty subtle but helpful for giving you information on whether you need to dig out your phone or take other action. I wanted to test drive it extensively before I decided to trust it. As a physician who is sometimes on call, I needed to know it was reliable, and it is. The connection screen in the app also shows charging and battery status. There are a couple of quirky things about the Ringly. It likes your location to be turned on when it connects for the first time (or sometimes when it reconnects after a period of non-use). Every once in a while it doesn’t get along with my phone – usually first thing in the morning – and you have to “forget” it in your Bluetooth settings and then rediscover it. Sometimes it wants to be on the charger in order to connect. Issues are uncommon, but you need to know the tricks in case it acts up on you. They’re also putting out app updates pretty frequently, and if it really doesn’t want to connect, usually it’s because there is an app update available. Another quirk is that Ringly does all their support through email and Facebook chats, so forget it if you like to talk to an actual person. The other bonus of the Ringly is that it is an activity tracker. Based on how my phone identified it before I had the Ringly app installed, I suspect that it has Garmin innards. I tested it against my trusty Garmin Forerunner and found that it under-calculates by about 30 percent, however. That’s a pretty big margin of error if you’re into accurate distance traveled, but if you just want something as a relative indicator of activity, it gets the job done. The “silver” bracelet is actually stainless steel, so I’ve worn it running and to the gym with no worries. Not sure I’d do that with the plated gold-tone version. We’ll have to see how it does on the exhibit hall floor. I’m counting on it to remind me of my appointments and to notify me when people are trying to track me down. It’s also pretty snazzy as a bracelet, so I can’t complain about that. The stone is smaller than I anticipated. If only they’d come out with a stainless version of the ring, I’ll be first in line. What’s your favorite piece of wearable tech? Email me.